In today’s world of growing technology, severe competition and economic uncertainty are the two defining factors for the businesses. Each company wants to handle such businesses without compromising its customers. Technology comes in handy as such times. The insurance startup companies have integrated technology with their business by saying yes to insurance app development to provide them an edge over competitors. The insurance apps have also helped them to improve customer experience and satisfaction. Why is there a huge scope for Insurance apps development? The insurance startups claim to provide the best coverage against the unpredicted circumstances of life. The global insurance market premiums exceeded the US $4.9 trillion in 2017. This fact went unnoticed by the startups who are looking for a good business venture which can be extremely profitable. Here is a chart to prove the facts of growth in the purchase of policies per human. According to a study, the annual investments in insurance and technology have seemed to be doubled in the year 2018. 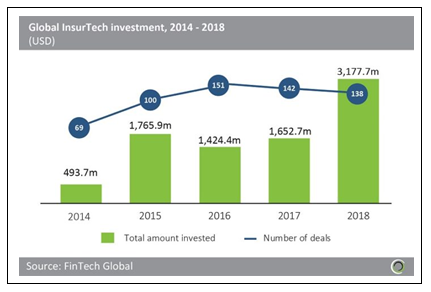 The Fintech Global database suggests money invested in Insurtech startups has reached around $3.18 billion worldwide which is almost double of $1.65b billion which was invested in the year 2017. Lemonade is a certified insurance company and deals in property and casualty insurance for homeowners and renters. The company is disrupting the good old business model of insurance by adding technology and transparency into the industry. It was never before that such transparency was seen in the insurtech sector. The insurance experience that they are creating is fast, affordable and stress-free. They do not gain anything through delaying or denying claims as they have introduced a flat fee for each transaction. So, they are into handling many pay claims instantly. They have this idea of treating the premiums as customer’s money that needs to be returned through ‘Giveback’, a unique feature that has been introduced through their insurance app. Each year, they donate the leftover money to various causes the customers care about. The Lemonade insurance app has more than 100 million downloads and is available at Maryland, Michigan, New Jersey, Arkansas, Arizona, California, Connecticut, District Of Columbia, Georgia, Iowa, Illinois, Indiana, New Mexico, Nevada, New York, Ohio, Oregon, Pennsylvania, Rhode Island, Tennessee, Texas, Virginia, Wisconsin and is still expanding its branches. According to a news in Techcrunch, Lemonade has recently received a funding of $300 million and have sold over 500,000 policies till date. The company has been a part of 6 funding rounds and has raised $480 millions of funding amount. The app aims to replace the brokers and bureaucracy with machine learning, AI and chatbots. They have made purchasing policies hassle-free by promising zero paperwork. 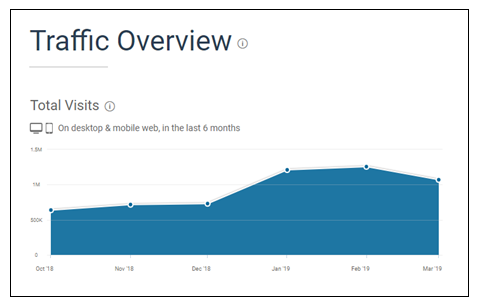 Here is a graph of traffic on the website and mobile app of Lemonade insurance app in the last 6 months. Lemonade has actually turned the bitter lemon of insurance from being evil to doing social good. 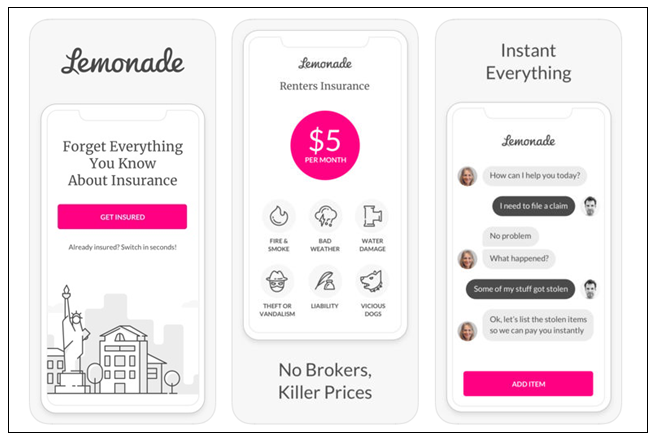 Lemonade has disrupted the insurance world by offering live insurance policy feature. The old insurance system had tedious contracts which were extremely long and not understandable by the common man. Also, it took a lot of time to go through those documents. But Lemonade’s live policy has been a lifesaver which gives the users a clear idea of what is covered in the policy. Unlike the tiring paperwork, the policy is a matter of a few clicks where the user just needs to scan the QR code and is good to go. The user is allowed to do everything online like view their policies, make changes and file claims. The users are allowed to make edits and contributions to their policy right from their smartphones. The users can cancel or get the policy at a new address too. The home insurance app for homeowners and renters provides another interesting feature Zero everything. They claim it to be like the undo button for real life. It’s a feature using which you can save deductibles without an increase in the price. The feature can be used twice a year. It is like a win-win situation for the customers. No matter how high or low the value of the claim is, the Zero everything is a unique feature that allows the users to ‘undo’ losses for their stolen bikes to water damages due to burst pipes. With Zero everything the customers can claim the payments with no deductibles and no rate hikes. Also, this feature can be activated once per policy and if there are more than 2 claims in one year, the third claim will have a $250 deductible and it will be counted towards possible rate hike upon renewal. Ever felt the pain while finding the right kind of insurance? The AI-powered chatbot Maya of Lemonade app is a refreshing development in terms of insurance apps. Lemonade’s chat-based insurance flow works really well and feels non-intrusive and much interactive. The user doesn’t realize how many inputs they are providing as Maya makes it feel like smooth chat flow. The simplicity of the app is a result of this chatbot. People prefer quick answers and want their jobs to be finished as early as possible. 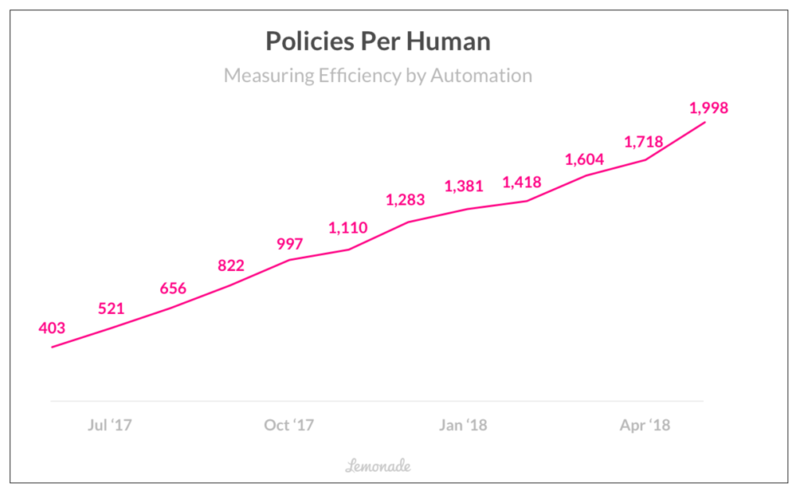 Automating the insurance policy system has made it easier for the policy seekers to find policies and manage them right on their smartphones. The chatbots actually run on Natural Language Processing and is a better way to provide enhanced customer experience than humans. The chat engine supports CXAI and answers the complicated questions for the policyholder and even edits and manages the policies for them. Insurance apps are all about the value of money. The payment plays a huge role when it comes to insurance policies. Providing a smooth and seamless payment structure for the users is the key to success. The safety and security of the user’s information also play an equally important role. So, being an insurance company, you need to be very careful while choosing the payment gateway for your insurance app. We provide a complete solution for insurance app development right from research regarding the scope of the app to the features that can make your app unique. If you are a startup looking for a new business venture, the statistics of the insurance sector will surely strike the chord in you to explore the industry. If you wish to dive deep into the insurtech, make sure you are powered with digitalization. Having an app with AI-powered bot can do wonders. If you are thinking about whether you should go for the MVP or develop a full-fledged app, please connect with us through the contact us form. We can help you with validating your ideas and fill you up with further information like the cost and opportunities for developing an insurance app.